Guys can look forward to a more natural way of enhancing fertility. According to a report on Dole Nutrition News, new findings presented at a conference of the Indian Association of Urologists suggest that 2 compounds found in the watermelon have benefits for male reproductive health. Almost 92 percent of the watermelon is water but the remaining 8 percent is loaded with lycopene, an oxidant also found in tomatoes which gives them their red colour. It has been found that there is more lycopene in the red varieties of watermelons than tomatoes. A study on infertility subjects who took part in a month-long trial of lycopene supplementation showed improvements in sperm concentration and motility. Watermelons also have beta carotene and a phyto-nutrient, citrullline, which can relax blood vessels. Phyto-nutrients are naturally occuring compounds that are bioactive, or able to react with the human body to trigger healthy reactions. 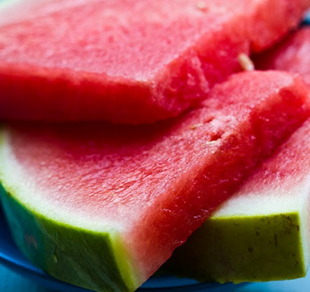 Scientists now know that when watermelon is consumed, citrulline is converted to arginine through certain enzymes. Arginine is an amino acid that works wonders on the heart and circulation system, maintains good immune system and boosts nitric acid which relaxes blood vessels, producing the same effect that Viagra has for treating erectile dysfunction, and maybe even preventing it. While lycopene is found in the red flesh of the watermelon, citrulline is mostly concentrated in the rind. With one compound combating free radicals, and the other fighting erectile dysfunction, the watermelon may be the one fruit that can promote overall male reproductive health.